Sydney Olympic Park – 10km from the hotel, a 15 minute drive. A place that will surprise you at every step! 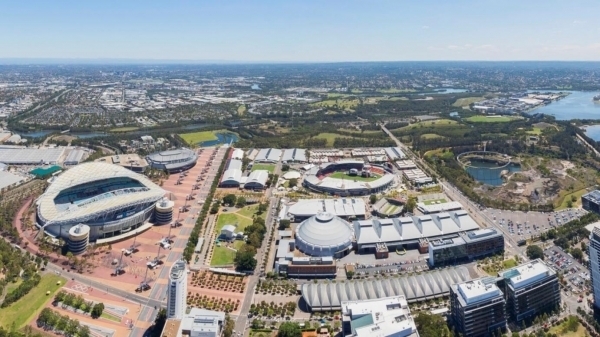 Sydney Olympic Park is Australia’s premier events destination, home to ANZ Stadium, Allphones Arena and world-class venues that feature some of the most exciting shows, sporting events, performances and exhibitions. For shopaholics Homebush Bay is a short 10 minute drive to the Direct Factory Outlet, more commonly known as DFO. This shopping centre offers a wide selection of outlet priced luxury and high fashion. Not keen on clothing? DFO also offers heavily discounted homewares, furniture, electronics and backyard accessories. If you’re interested in retail therapy that is more cosmopolitan simply catch a train from Olympic Park station and arrive at Town Hall station where you can visit Pitt St Mall, one of Sydney’s most popular shopping streets. While you’re in the area you can also find Hyde Park, St Marys Cathedral, the Botanic Garden and the NSW Art Gallery all within walking distance! After a long day of walking save your energy and explore the delicious culinary experiences available at Olympic Park. For guests looking for a more cultural experience then be sure to book one of the many concerts, plays and exhibitions that occur all year round at the Olympic Park. Most venues are a 10 minute walk from the train station, meaning you don’t have to spend money on taxis or even paid parking. Looking for accommodation that’s close to Sydney but is not in the heart of the CBD, with natural and historical attraction close at hand? Give Homebush Bay a try. Sitting on the Southern shoreline of the Parramatta River, Homebush Bay is 16 kilometres to Sydney’s west. Take a look at our Hotel located near Homebush and save on accommodation when you come to Sydney, especially when looking for a hotel near Homebush or Sydney Olympic Park. Bicentennial Park, which includes Homebush Bay’s mangrove wetlands, is a 40-hectare parkland with green hills and a peaceful river. Wander along the boardwalk and enjoy the local ecosystem, for those who do not wish to walk, cycling is also extremely popular and bikes can be hired from the park kiosks. Dine at the local café situated on the riverbank, otherwise you can pack your own picnic or utilise the riverbank BBQ shelters with seating for large numbers of people. Holiday Inn Parramatta is the perfect option for a hotel near Sydney Olympic Park as the two locations are only 3 short kilometres apart. Sydney Olympic Park is most famous for hosting the 2000 Sydney Olympic Games in its large complex of stadiums and arenas. These venues are now used to host concerts, sporting matches and other entertainment like the Easter Show. The Olympic Park boasts a range of culinary options for breakfast, lunch and dinner as well as chic bars for evening drinks. One of Homebush Bay’s strangest and most unique attractions is its collection of shipwrecks. These heritage protected vessels served Australia during both WW1 and WW2 and washed up in the bay when a section of it was converted into a shipwreck yard. One of the most well known wrecks is the SS Ayrfield, a rusty hull that sprouts foliage from its deck and glows a deep red as the sun goes down. Homebush Bay is only 16 kilometres from the Sydney CBD and its famous icons such as the Opera House and the Harbour Bridge. What are you waiting for? Book your Parramatta accommodation to be close to the action at Homebush!